Discussion in 'Performance and Tuning' started by dirtytaco2010, Oct 16, 2010. Poll closed Nov 15, 2010.
instead of going that route id suggest going with the Doug Thorely Long tube headers! Ah ok lol kinda figured there had to be something that was keeping headers from being considered! Are the headers really worth it? 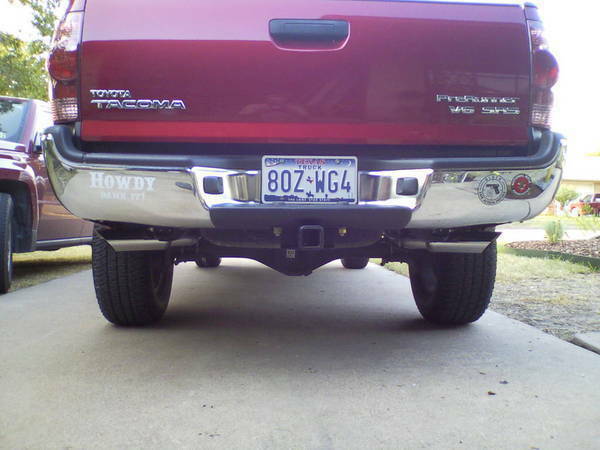 I put on a Flowmaster Super 40 single in dual out with 3.5x12 Echo Tips, I wanted something that kept the same departure angle of the truck. Go witht he muffler. Why spend extra money for the cat back exhaust system?? Just get a muffler... Theres no reason to buy a system, your gains are minimal. Satoshi grille, ARE cap, Rubber Bed mat, TRD Quick-shifter, N-Fab step rails, Wet Okoles seat covers, Husky Floor Mats, Stubby antenna, AFE Pro dry Filter, Thule rack w/ Cargo box, Sportz SUV Tent, Custom fit Air Mattress for Bed, TRD cat-back exhaust, de-badged and Sockmonkey'd. Hella Black Magic 500s, Toytec ULK, Dakar OME leafs, LR Uca's. Just found a 5k mile old trd cat back for $200. REALLY impressed with the extra power. It's noticeable in the 2-3k RPM range. Great sound too! i have and was looking into this actually...was the install easy? is it just a clamp or do you need to have it welded on? You can weld or clamp, but for security sake, I would weld it. I will vouch for a muffler replacement. A catback is kind of nice because ease or install, but you are paying the premium price for about $30 worth of extra pipe. If you buy catback, you are limited to the manufacturers who actually make cat backs. Aero Turbine, my tacos muffler brand, as well as like wicked flows, do not make catback systems. So in that regard you are kind of limited. My vote is that you do a muffler swap. Take the truck to the shop and have them clamp a few different ones in, then weld in the one you like best. I like the catback because I seem to change my mind about sound a lot. 1st was a Banks catback, great sound just a bit too loud. My son has it on his now. 2nd was a TRD, great sound and just right for me on loudness. 3rd setup was a URD pipebomb which eliminates the rear cats and moves the driverside pipe up and out of the way for skid plates to get max. clearance with the TRD catback. This was too loud again. 4th setup URD pipebomb and stock catback. silent at low rpm and slight throttle openings. Howls nicely at higher rpms and wide open throttle. 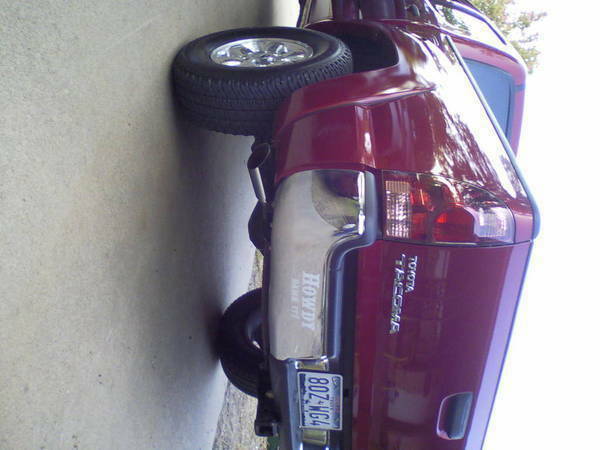 I also have the TRD intake so it adds a bit to the wide open howl as well. I like this (for now ) we will see how things go. I just prefer the easy changing without welding muffs for my use. Debadged, mud tires stock size, painted radio surround, painted door switch panels, all season rubber floor mats, 6k hid headlights/fogs, k/n drop in air filter, blhm, custom y pipe and side exit cat back 3in, painted rear bumper, front skid plate, r/r hitch, secondary air filter r/r mod, lots coming!!! A guy at my work just did up a custom y pipe, rear cat "delete" and custom cat back exhaust with a flowmaster 40 muffler. Piping is all 3 in and i gotta say if you can make one yourself or have one made do it it was worth it for me at least!!! sounds awesome and even though power gain is minimal it is a definite smoother power band. can yah send pichas of that setup? sounds kindah like what i wanah doo. nice, i wanna get something like this too..